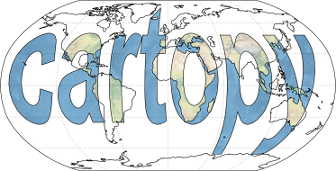 This module contains utilities that are useful in conjunction with cartopy. Add a cyclic point to an array and optionally a corresponding coordinate. data – An n-dimensional array of data to add a cyclic point to. coord (optional) – A 1-dimensional array which specifies the coordinate values for the dimension the cyclic point is to be added to. The coordinate values must be regularly spaced. Defaults to None. axis (optional) – Specifies the axis of the data array to add the cyclic point to. Defaults to the right-most axis. cyclic_data – The data array with a cyclic point added. cyclic_coord – The coordinate with a cyclic point, only returned if the coord keyword was supplied.